Friday was another awe-inspiring day for meteorologists. Yes, it's early to be tracking 80-100 tornadoes in a single day. This kind of outbreak would be unusual for April or May, but to have so many large, violent, potentially EF-3 and EF-4 tornadoes in a single day on March 2? Highly unusual - a symptom of La Nina perhaps, which does correlate with a more violent tornado season for much of the USA. Nothing severe in our forecast: a clipper drops a coating to an inch today, another coating possible tomorrow (most roads wet during the daytime hours - the sun angle is high enough now to keep most roads snow-free), but tonight a few highways may become slippery. 40 returns Monday, 50 will feel great by Tuesday, in fact temperatures are forecast to trend well above average into mid March. I wouldn't be surprised to see 60 close to home by mid March. Needless to say (but I'll say it anyway)...if you like snow make the most of THIS WEEKEND. It won't get any better than it is out there right now. Today's blog has more on yesterday's tornado outbreak, an early start to tornado season nationwide, hints of April on the way, "debris balls", new technology to increase tornado warning times, some good Q&A, Apple's "Siri" has some competition, paying for Facebook friends (? 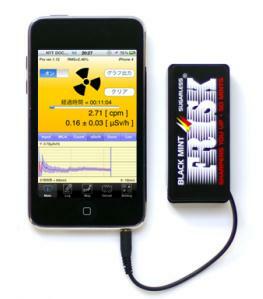 ), a Geiger Counter for your iPhone, a "fast forward spring? ", the rate of ocean acidification higher now than it was in the last 300 million years, and more than you wanted to know about Justin Bieber's new (electric) ride. 35 F. high temperature in the Twin Cities Friday. 35 F. average high for March 2 at KMSP. 17 F. high temperature last year, on March 2, 2011. 10th warmest February on record for Minnesota. Source: Dr. Mark Seeley. Details below. 6 months in a row of warmer than normal temperatures in the Twin Cities. +6.9 F. February temperatures were nearly 7 degrees warmer than normal in the Twin Cities metro. 81 separate tornadoes on Friday (as of 7 pm yesterday) from Alabama to Ohio. Details below. Photo: AP Photo/The Huntsville Times, Dave Dieter. 29 tornadoes on the ground, simultaneously, at one point late Friday afternoon. Source: CNN. 196 tornado warnings, 240 severe thunderstorm warnings, 432 severe storm reports as of 7 pm central on Friday (source: Alabama TV meteorologist James Spann). 2 small tornadoes were reported near Stapleton and Greeley, Nebraska on February 29 - the first February tornadoes ever reported in Nebraska. Source: WOWT-TV. Cincinnati/Northern Kentucky International Airport (CVG) was closed as of Mar 02 at 04:30 PM EST “Due to FOD ON RWY, the Cincinnati/Northern Kentucky International Airport (CVG) was closed as of Mar 02 at 04:30 PM EST. 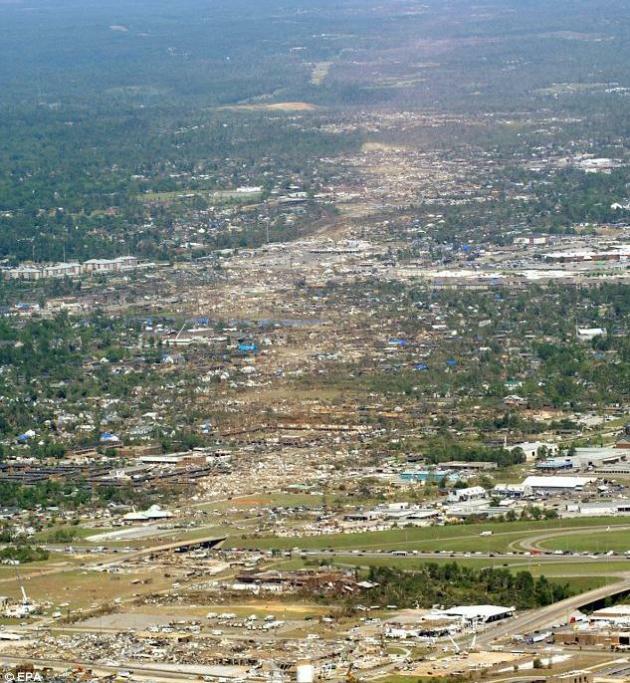 The date/time when the airport is expected to reopen is not known.” Tornado debris? 300 million years. The world's oceans are thought to be acidifying faster than any time in the last 300 million years. Full article below. 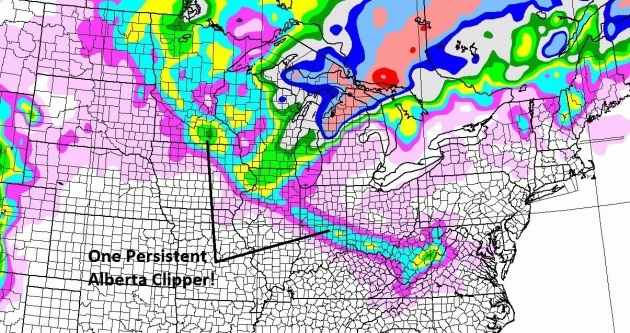 Last Best Hope For Snow Lovers? I can't stress this enough - if you like snow, and want one more weekend to play in the snow (sledding, snowmobiling, cross country skiing) this weekend is probably your best bet, possibly for the rest of the winter season. Considering long-range guidance brings 40s and 50s into central and southern Minnesota as early as next week - I wouldn't be surprised to see 60 here by mid March - you might want to take advantage of chilly temperatures and excellent snow conditions this weekend. See the raw NOAA data for yourself here. A 6 Month "Warm Bias". Dr. Mark Seeley has more on our growing number of warmer than average months in his weekly WeatherTalk blog: "February's climate kept up the trend of the past six months delivering above normal temperatures to the state. Most observers reported average monthly temperatures that were 4 to 9 degrees F above normal, with the highest departures in the north (International Falls was 9.2 degrees F above normal). 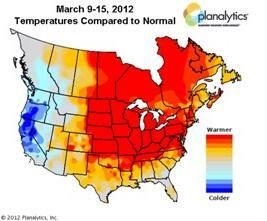 February 2012 ranks 10th warmest statewide historically. Extremes for the month ranged from 55 degrees F at Milan, Montevideo, Marshall, and Lamberton on February 2nd to -20 degrees F at Fosston on February 11th. Despite the warmer than normal month, Minnesota reported the coldest temperature in the 48 contiguous states 7 times during the month." Chilly Weekend - Hints of April By Tuesday. All the models show a significant warming trend next week; there's a good chance we'll see low 50s by Tuesday afternoon, followed by slightly cooler weather the latter half of next week. No bitter fronts - certainly nothing subzero brewing looking out through March 20 or so. 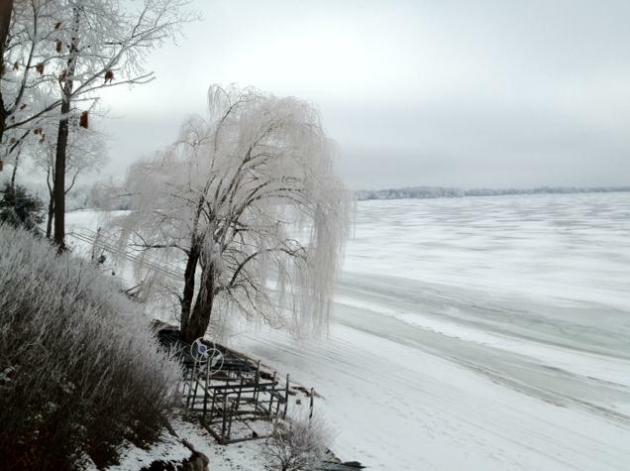 March 2012: Hints of April? Here's an excerpt from the weather firm Planalytics, focusing on the next couple of weeks and an overall bias toward much warmer than average temperatures east of the Rockies: "But as we move into this next time period, businesses should prepare for overall warmer than normal conditions. Many locations in the Northeast, Great Lakes, and Canada will experience temperatures up to +15F. above normal. While the potential for storms and brief periods of cooler temperatures are possible, next week will continue the trend of warmer than nnormal for most locations, and warm enough to dive additional lift in seasonal demand." No Major Storms (of any flavor) Brewing. A very persistent Alberta Clipper, putting down a narrow, 900-mile wide carpet of a couple of inches, may drop an inch of snow today, another coating of flurries on Sunday. That's about it in the snowfall department until further notice. 84 hour NAM snowfall prediction courtesy of NOAA and WeatherCaster. A Deadly Friday. When I posted this update Friday evening 81 separate tornadoes had touched down from southern Alabama into southern Indiana and southern Ohio - a few of these were probably large, violent, long-lasting EF-3 and EF-4 tornadoes, possibly more than 1/2 mile wide. The latest count from SPC, NOAA's Storm Prediction Center here. Weather Carnage. Friday was one of the most damaging and deadly days since April 27 of last year. 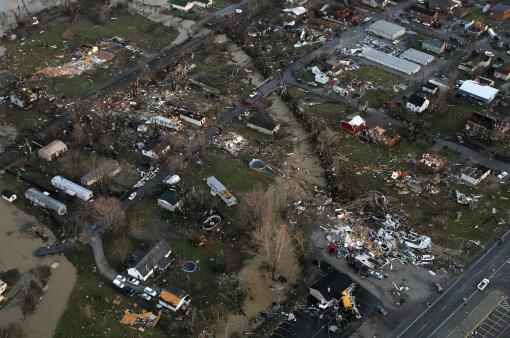 A handful of small towns from southern Illinois and southern Indiana into Kentucky were literally wiped right off the map: "Damage is seen from above the Henryville, Ind., area, Friday, March 2, 2012. Powerful storms stretching from the U.S. Gulf Coast to the Great Lakes in the north wrecked two small towns, killed at least three people and bred anxiety across a wide swath of the country on Friday, in the second deadly tornado outbreak this week. (AP Photo/The Courier-Journal, Michael Clevenger)." * Indiana Town "Completely Gone" After Tornado Kills At Least 3, Official Says. 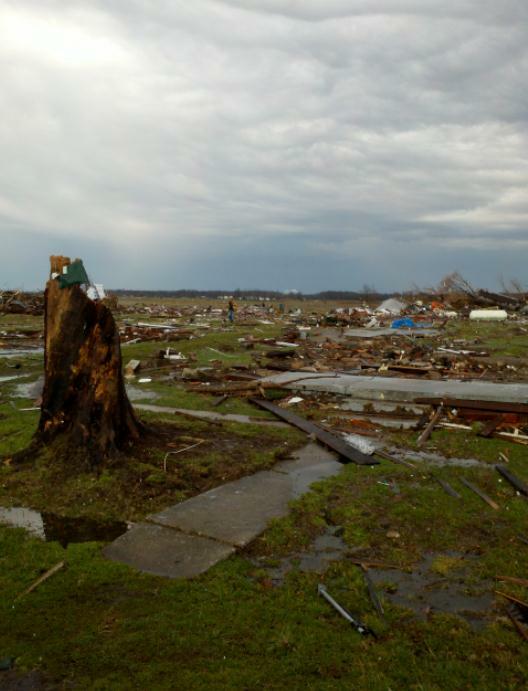 The Chicago Sun Times has more details on the destruction of Henryville, Indiana here. 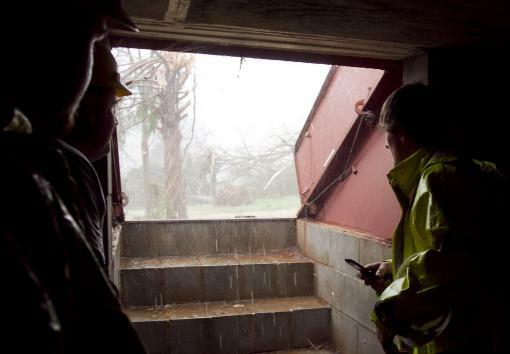 ** WISH-TV reports that schools in Henryville let out 20 minutes before the tornado struck. Atmospheric Battering Ram. Weatherbug meteorologist Ben Michalak captured this photo in Indiana during a cross-country drive from Chicago to D.C. Waiting Out The Storm. In a hurricane you want to get up, as high as possible, at least third or fourth floor of a well-constructed building (if you can't evacuate safely inland). In a hurricane the main concern is not the wind, but the storm surge, a sudden rise in tide levels in a matter of minutes. In a tornado the goal is to get below grade, under ground, to avoid flying debris, which is the biggest cause of death and injury: "Police, rescue workers, and other local media gather in a storm shelter to ride out another threatening storm as it approaches areas already damaged by an earlier tornado on Friday, March. 2, 2012, in Athens, Ala. Powerful storms stretching from the U.S. Gulf Coast to the Great Lakes in the north wrecked two small towns, killed at least three people and bred anxiety across a wide swath of the country on Friday, in the second deadly tornado outbreak this week. (AP Photo/Butch Dill)." Evidence Of Severe Upward Motion. I start to get nervous when I see golfball size hail or larger - it means that a thunderstorm updraft is especially intense. The larger the hail, the stronger the updraft, and potentially the greater the risk of a tornado. 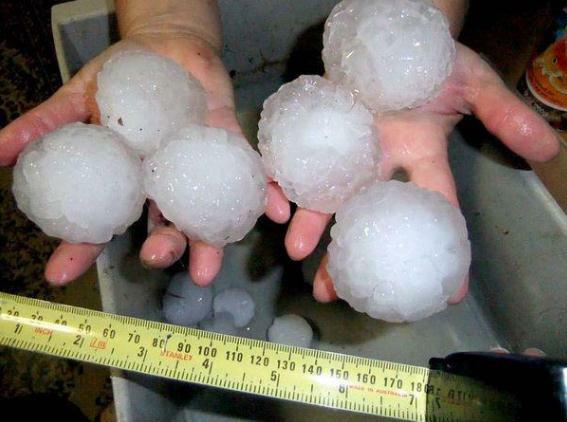 Here are some examples of baseball-size hail in southern Indiana, courtesy of Antranik Askander. Mind-Numbing Damage. Two deadly days of tornados in just one week. It's true that early March is prime time for tornadoes across much of the Deep South, but to have such widespread tornado outbreaks (Florida to West Virginia) on March 2 is a bit unusual: "A tornado left a path of destruction as it passed through Friday, March 2, 2012, in Athens, Ala. 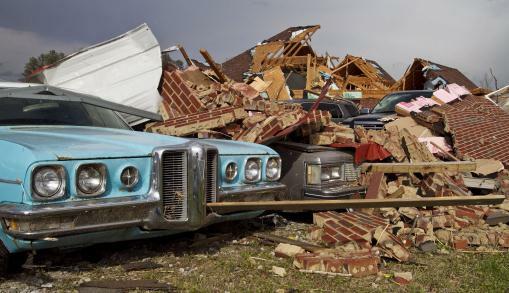 Powerful storms stretching from the Gulf Coast to the Great Lakes flattened buildings in several states, wrecked two Indiana towns and bred anxiety across a wide swath of the country in the second powerful tornado outbreak this week. (AP Photo/Butch Dill)." 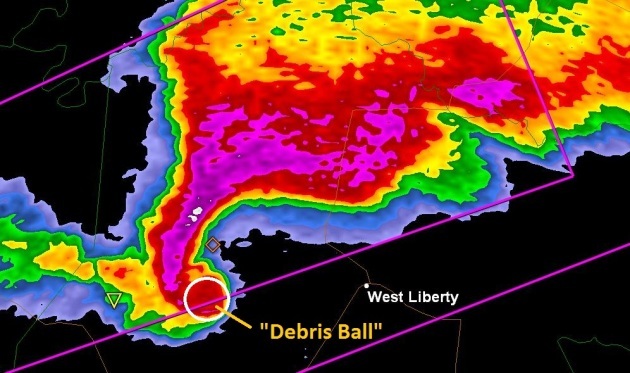 Confirmation Of A Tornado On The Ground: A "Debris Ball". The new dual-polarization Doppler Radar from the National Weather Service sends out a vertical as well as a horizontal pulse of energy, making it easier to differentiate raindrop size, whether a storm is capable of rain, ice or snow, and even more important: these sweeping pulses of energy can detect actual debris being thrown up by a tornado circulation on the ground. Before now we had to rely on Skywarn spotters and law enforcement for confirmation. Now, with "dual pol" radar, it's possible to see the actual tornado structure itself. Over time this should result in even greater confidence for meteorologists, hopefully leading to fewer false alarms. The debris ball associated with a possible EF-4 tornado (above) tore into West Liberty, Kentucky late afternoon yesterday. An Early, Violent Start To Tornado Season. 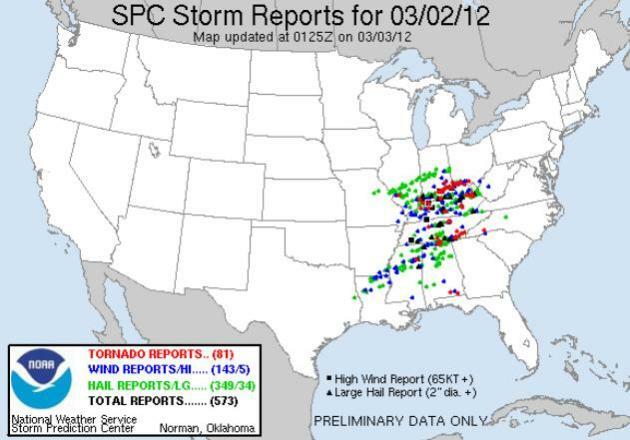 Last year an incredible 1,709 tornadoes were reported across the USA, according to SPC. Last year tornado season came on strong during late February, peaking in April and May. By comparison 2012 brought more tornadoes earlier (top graph), and many meteorologists I respect believe 2012 could set a new record for tornadoes, at the rate we're going. La Nina springs tend to be severe, stronger jet stream winds howling overhead, more wind shear available to spin up the rotating "supercell" storms that can go on to spin up tornadoes. There is a strong, statistical correlation between La Nina ENSO phases and more tornadoes downwind over the lower 48 states. There's little doubt that we are on track for another very violent spring across the USA. I have a semi-educated hunch that Minnesota's severe storm season will arrive a few weeks earlier than usual, and be rougher than average, based on La Nina (which is weakening, but not quite fast enough to avoid a serious uptick in severe storms nationwide). The trends are undeniable - it's probably going to be another crazy severe storm season in Minnesota. NASA, NOAA Team Up For Satellite To Increase Tornado Warning Times. Here's a timely post from CNN's Light Years blog: "After this week's massive storm system, which spawned tornadoes that killed 12 people, you might appreciate this: NASA and NOAA (the National Oceanic and Atmospheric Administration) have teamed up to launch a new GOES weather monitoring satellite: the GOES-R series, which will help warn people about severe weather sooner. GOES stands for Geostationary Operational Environmental Satellite. As they orbit Earth, the satellites monitor atmospheric conditions. They're basically fixed in place over a single spot on the planet, with a wide-angle view, collecting data around the clock. This lets meteorologists identify triggers for severe weather like hurricanes, flash floods, hailstorms and tornadoes." Photo credit above: "This image, from the GOES-13 satellite, shows a massive storm system moving across the eastern U.S. on Wednesday." 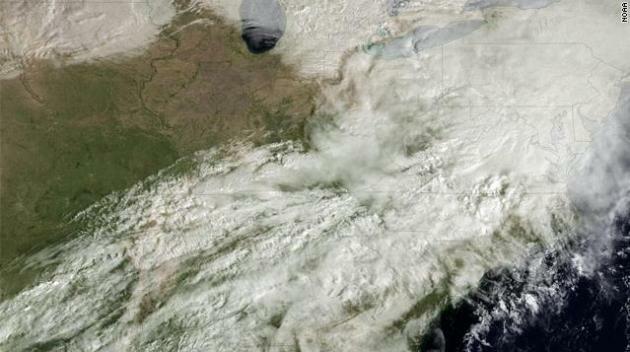 Courtesy NOAA, CNN. 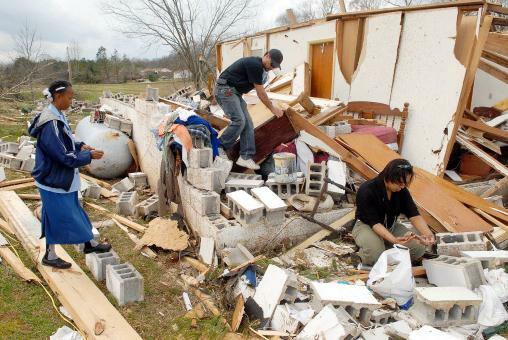 Joplin Tornado Survivors Seek Hurricane Katrina Lessons. The story from nola.com in New Orleans: "The group came to help rebuild a city still struggling to find its way more than six years after Hurricane Katrina, and to learn some disaster recovery lessons they can take back to their own storm-ravaged Missouri community. A 14-hour bus ride and 715 miles from home, the bleary-eyed bank executives, hospital administrators and church workers from Joplin, Mo., spent much of Thursday wielding paint brushes, sledgehammers and crowbars." 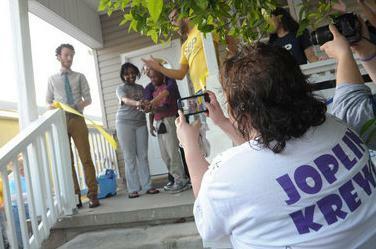 Photo credit above: "Volunteer Laura Veri from Rebuild Joplin, right, takes photos during St. Bernard Project's dedication of a newly renovated home that was destroyed by Katrina in New Orleans, Thursday, March 1, 2012. Nearly two dozen volunteers from Rebuild Joplin partnered with The St. Bernard Project, which renovates Katrina-devastated homes in the New Orleans area. (AP Photo/Cheryl Gerber)." "Hi. 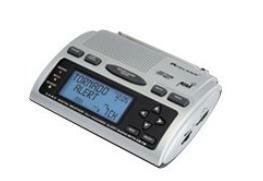 I have a question about weather radios. The tornadoes down south this past few days have reminded me to prepare for the "season" coming soon, and I am interested in getting a weather radio this year. I would like one with AM/FM and possibly a clock alarm. Do you have any particular advice or recommendations? Thanks for your time. I appreciate it." "Automatic alert warns you of hazardous conditions Perfect bedside alarm clock AM/FM radio with 6 memory channels Add or remove alerts S.A.M.E. 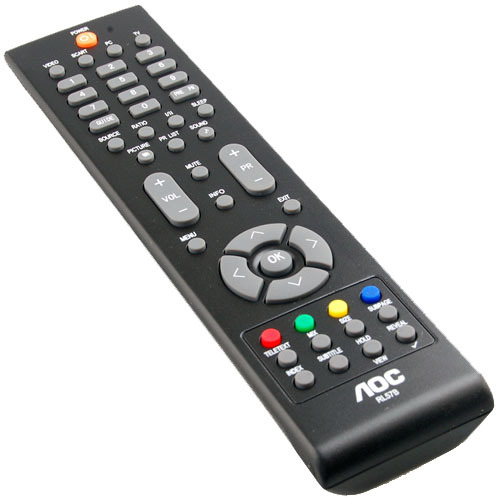 localized reception Color coded alert indicators Alarm clock with snooze Event expiration indicator Add or remove alerts Programmable siren level Silent programming 10 reviewable alerts 7 preset weather channels Receives over 60 alerts." Do a Google Search for NOAA Weather Radio, AM/FM and Clock Radio and you'll see scores of options, ranging in price from $25 to over $75. I hate to sound like a NOAA Preacher, but every home, office, school, nursing home and hospital should have at least one. It's the ultimate safety net. "I am curious about something I saw on February 28th late night into February 29th midnight. I saw two bursts of green light illuminate the sky. This was during the snowstorm when there was ice and snow on the trees and on the ground. Was this lightening during a snowstorm? There was no sound. Just a low hum like a motor running. It was the weirdest thing I have ever seen. 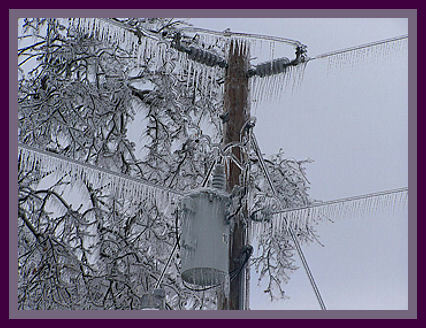 I know there was no powerline down since the power was up and there was no flicker in the lights. "When will your son graduate from the Naval Academy? I know this isn't a weather question, but you periodically comment on your son at the USN Academy. Graduation from a military academy is a great family experience. Our youngest son graduated from the US Air Force Academy a few years back and it was a super time. 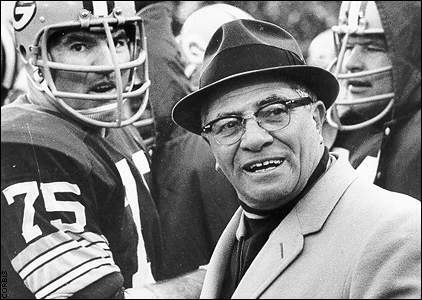 Several of my close retired friends graduated from the Naval Academy and they were outstanding men and leaders." Apple Prepares To Pull Down "Evi" From App Store. Did It Slap Down Siri? Uh oh, Siri may have company, and she/it is not too happy about that, from what I read. Techcrunch.com has the story: "Last month we reported on the launch of Evi, a new iPhone (iTunes link) and Android app (link) which was very Siri-like in its capabilities. Maybe it was too good at acting like Siri? Yes, Evi can’t do Siri’s trick of adding things to your iPhone Calendar or hook into reminders. But, ask “How do I make apple pie?” and Evi provides a list of recipes with web links. Siri can’t give you a direct answer and just asks whether you want to search the web. 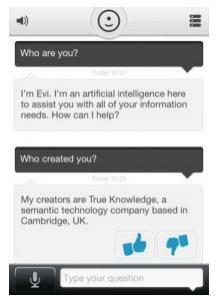 Perhaps it’s the fact that Evi is pretty damn good, and doesn’t look a million miles away from Siri, that Apple has told True Knowledge that it is going to pull Evi from the App Store. Wait, what?" 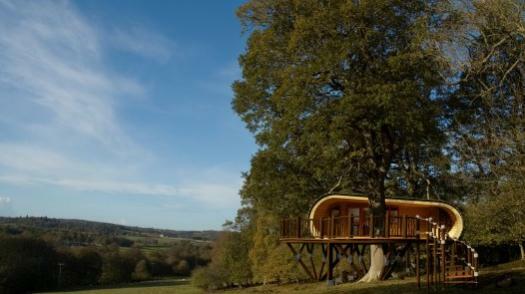 "Eco-Perch" Is The Rolls Royce Of Treehouses. Just in case you're thinking of spending way too much money on a treehouse, here's a story excerpt from gizmag.com: "While we love the dangling treetop retreats located at Sweden's Treehotel, and the House Arc had us yearning for a private backyard hideaway, the eco-PERCH has to be the Rolls Royce of modern modular tree-houses. This eco-lodge concept was created by the UK architectural firm Blue Forest, which has a background in the design and construction of luxury treehouses and lodges." WHNT Offering Viewers Money To Be Meteorologist's Facebook Friend. Wow - it's come to this? I'm sure Jason is a good guy, and might even be your FB pal for free, but the notion of winning at $519 gift card might just make me hit the "like" button. Repeatedly. But why stop there? Maybe $2 for every favorable tweet? Talk about a slippery slope. TVSpy.com has the unsavory details: "Just in case his extensive coverage of tornadoes sweeping through Alabama wasn’t enough to entice viewers to Like WHNT chief meteorologist Jason Simpson on Facebook, the Huntsville CBS-affiliate is now offering $519 to be his friend. 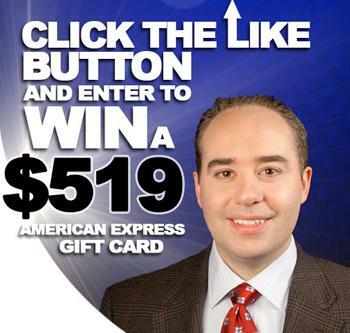 WHNT, channel 19, has posted a big promotion on Simpson’s Facebook page, offering viewers a chance to win an American Express gift card if they Like the veteran meteorologist." Happy Birthday Justin! A Look At Bieber's $100,000 Electric Car. From the Los Angeles Times: "Justin Bieber turned 18 on Thursday and to celebrate, his manager surprised him with a Fisker Karma -- a $100,000 electric car whose sporty physique belies its eco-friendliness. Bieber's manager, Scott Braun, presented the Canadian pop star with the car on the "Ellen DeGeneres Show," of all places. "We wanted to make sure, since you love cars, that when you're on the road you are always looking environmentally friendly," Braun said as DeGeneres beamed in the background. "And we decided to get you a car that would make you stand out. I think you know where I'm going, and you're kind of freaking out right now. That's a Fisker Karma." 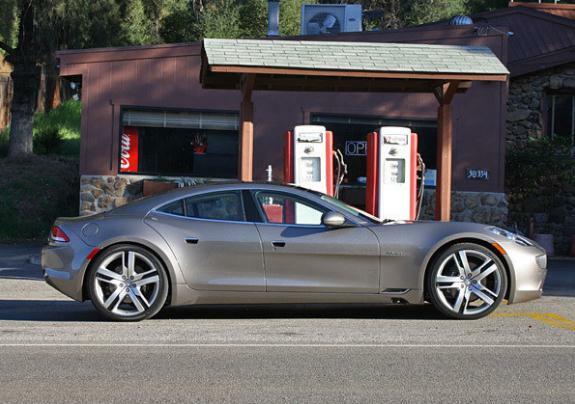 Photo credit above: "Justin Bieber's new wheels: The Fisker Karma. The car was presented to Bieber by manager Scott Braun on the "Ellen DeGeneres Show." (David Undercoffler / Los Angeles Times)." "Pocket Geiger": The $46 iPhone Geiger Counter. Here's one app I'll bet you don't have. Hopefully you'll never have a need for this, but just in case - more details from our tech-savvy friends over at gizmag.com: "In what seems to be a response to public fears about radiation levels following the Fukushima crisis, a Japanese organization called Radiation Watch has launched Pocket Geiger, a Geiger counter iPhone peripheral and accompanying app aimed at concerned individuals." Instant Summer. Much of Florida has experienced record warmth in recent days with highs in the mid to upper 80s, typical weather for late April. Record highs have been set in Ft. Myers, Sarasota and Tampa. 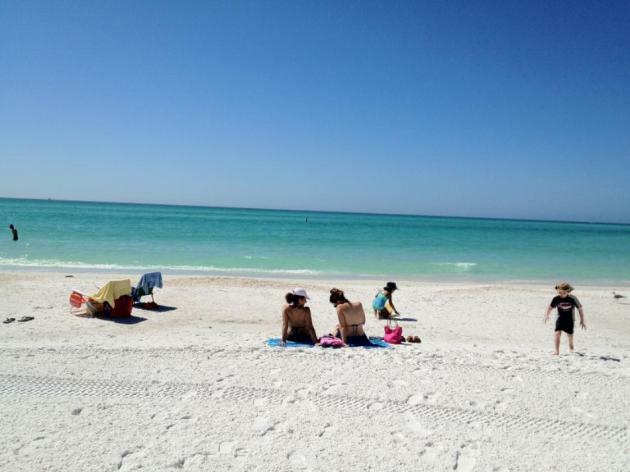 Photo above is from Lido Beach, in the Sarasota area. As Good As It's Going To Get For Minnesota Snow Lovers. 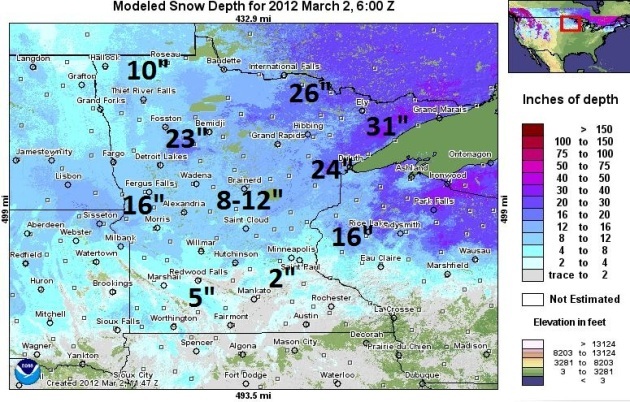 16" snow on the ground at International Falls, 10" up at Duluth, 7" St. Cloud and 2" in the Twin Cities. I have a hunch we've peaked in the snowfall department - those amounts will come down (rapidly) next week as highs reach the 40s; 50 possible south of the Twin Cities by Tuesday. Friday highs were close to average for early March, ranging from 28 at Alexandria to 33 in St. Cloud, 35 in the Twin Cities and 37 at Grand Marais. Florida Might Be Nice. 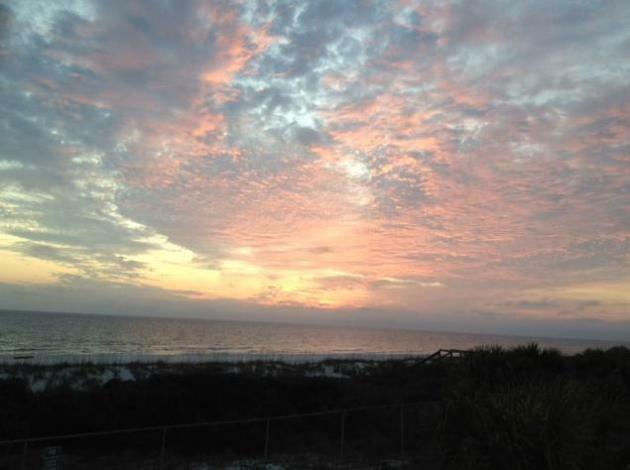 Thanks to Karen Wagner for this fine photo from Panama City, Florida. I'm not clairvoyant. That's one skill that would come in handy for a weather guy. But the trends are pretty obvious by now: the atmosphere is on "fast-forward" - the maps look more like early April than early March. According to Dr. Mark Seeley February was the 10th warmest in Minnesota's modern history; the last 6 months in a row have been (significantly) warmer than average, statewide. 21.8 inches of snow, the least since 2004-05, when only 25.5" fell the entire winter. Will we see more snow? Probably, but I don't see anything brewing through mid-March. Too dry, and too warm. We'll see 50s by Tuesday; the GFS hinting at 60 by mid-March. This is still Minnesota right? February was the first above-average month for precipitation since August, but I'm still worried about drought. 96% of Minnesota is in a moderate drought. And at the rate we're going a fading La Nina coupled with a strangely-energized jet stream may favor an early start to severe storm season. Great. A coating to 1" flurries may fall today. 40 will feel good Monday; a shot at low 50s Tuesday. Is winter over? Starting to wonder. 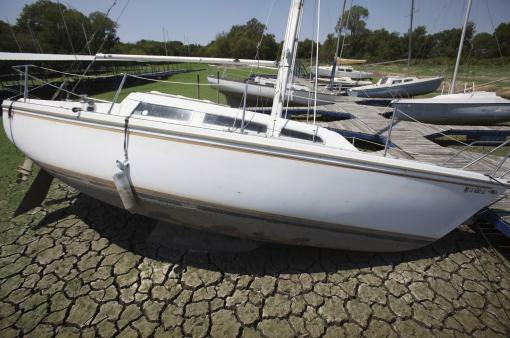 Photo credit above: "In this Tuesday, Aug. 16, 2011 photo, docked sailboats sit high and dry at a marina on Benbrook Lake in the Fort Worth suburb of Benbrook, Texas. A wet winter across Texas has surprised weather experts who aren't sure when the drought-stricken state will get longterm relief. Some forecasters say the La Nina weather phenomenom may end just in time to allow for spring rains. But nothing short of massive storms, 200 to 500 percent of normal rainfall for three months, will end the severe drought, according to weather data. (AP Photo/LM Otero)." Houston Insurance Claims Lawyer Says 2011 Natural Disasters Can Lead To 2012 Disputes. Here's an excerpt from The Houston Chronicle: “We escaped the wrath of hurricanes and had fewer tornadoes, but the lack of rainfall extended the drought in many areas of the state” in 2011, said Mark Hanna, a spokesman for the Insurance Council of Texas. “That led to record wildfires, which I don’t think we will soon forget.” Six of the top 10 largest fires in Texas history all occurred in April 2011, according to the Insurance Council. The costliest wildfire in Texas history erupted on Labor Day weekend in Bastrop County, the Council said. It resulted in two deaths and 1,600 homes destroyed by fire. 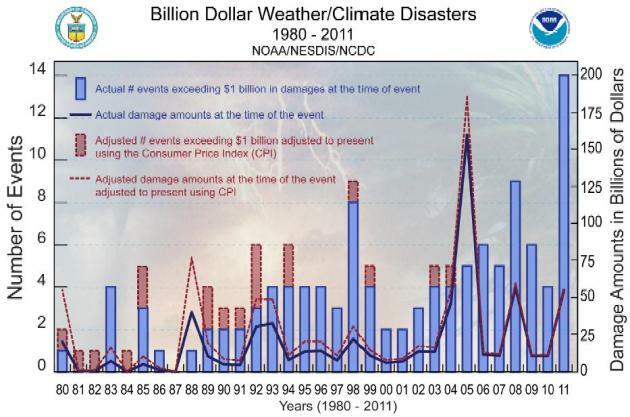 Insured losses were set at $325 million." Graphic above courtesy of NCDC. 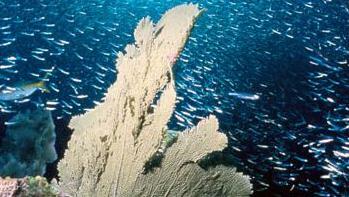 Ocean Acidification Worst For 300 Million Years. TGDaily.com has the story: "The world's oceans appear to be acidifying faster than at any time in the last 300 million years, and sea life may well be unable to adapt. The last time acidification took place anywhere near this fast was during the Paleocene-Eocene Thermal Maximum, or PETM. In the last hundred years, rising carbon dioxide from human activities has lowered ocean pH by 0.1 unit, and the Intergovernmental Panel on Climate Change (IPCC) predicts that pH will fall another 0.2 units by 2100, raising the possibility that we may soon see the same sort of ocean changes as those observed during the PETM." 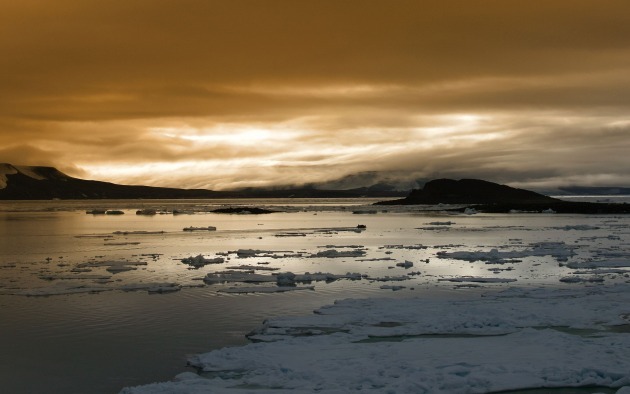 Climate Change Could Impact On Polar Ecosystems. 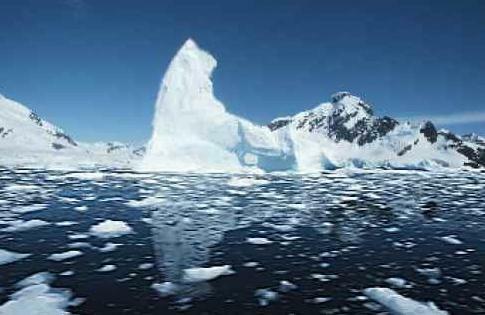 Here's an excerpt of a story from physorg.com: "Researchers studied cyanobacteria - the blue-green algae found in almost every body of water - in samples taken from the Arctic and Antarctic. "Blooms of these tiny microbes - known as cyanobacteria mats – can form in waters where there is an abundance of nutrients. These can often be seen on the surface of lakes, ponds, streams and other stretches of water. Cyanobacteria are hugely important because of their role in 'carbon-fixing' - absorbing carbon dioxide from the atmosphere and helping maintain healthy oxygen levels while turning the carbon into food for other organisms. However, some cyanobacteria can also contain toxins which can be potentially harmful for other organisms, especially animals."